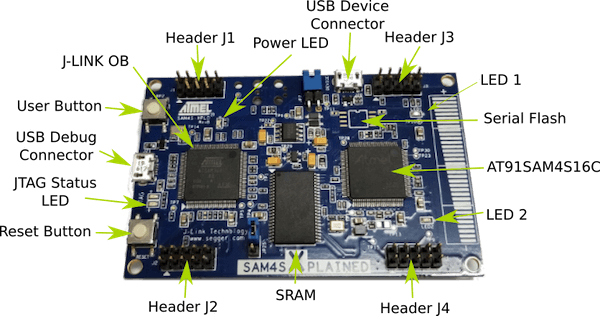 The SAM4S Xplained evaluation kit is a development platform to evaluate the Atmel SAM4S series microcontrollers. Other hardware features are not currently supported by Zephyr. The default configuration can be found in the Kconfig boards/arm/sam4s_xplained/sam4s_xplained_defconfig. The SAM4S Xplained Online User Guide  has detailed information about board connections. Download the SAM4S Xplained Schematic  for more detail. The SAM4S MCU is configured to use the 12 MHz internal oscillator on the board with the on-chip PLL to generate an 84 MHz system clock. The ATSAM4S16C MCU has 2 UARTs and 2 USARTs. One of the UARTs (UART0) is connected to the Segger J-Link OB chip (the AT91SAM3U4 is programmed to be Segger J-Link OB). Segger J-Link OB brings the UART out as a virtual COM port. The section flashing uses the UART from the Segger USB debug connection. The SAM4S Xplained board comes with Segger J-Link OB. This provides a debug interface to the SAM4S16C chip. You can use Ozone or JLink to communicate with the SAM4S16C. Download JLink from the Segger JLink Downloads Page . Go to the section “J-Link Software and Documentation Pack” and install the “J-Link Software and Documentation pack for Linux”. The application JLinkExe needs to be accessible from your path. Connect the SAM4S Xplained board to your host computer using the USB debug port. Then build and flash the Hello World application.